In the long journey, especially if you are not tandem, it is important to bring a backup paddle. Paddles can drift and can also be broken. With no oars we can not move. It could be plastic, but it needs to be plated and make sure it is tightly tied. It must be remembered that both sea water and sea air contain salt and salt can settle into more ‘stubborn’. Not to mention it further damages the quality of certain foods and goods. This is very, very important. Minimum mobile phone, maximum radio communications or even a satellite phone. Make sure, once again make sure the sufficiency of battery and phone credit. You need to tether every time you land or lean on another boat. Also you need to help colleagues if anything happens. My own experience, I often ask the fisherman for help when the sea is too difficult, and like me on the crane. That’s why the rope is always important. The readiness of this information is absolute if you will travel long distance either one day or multi day. If only going to relax and play around the shady and safe beach is usually not necessary, and find here for fishing kayak reviews. Keep in mind that all the forecasts are just these forecasts can miss. But at the same time do not ever think that because the forecast is not important !. It is a homework that does or does not make a big difference to the safety, comfort, and even the cost of a trip. – View weather forecast on BMKG and / or on other weather sites about your kayaking location. – Ask residents how the weather last week. – Ask the residents how the weather was in the same month last year. – Ask residents about current positions and times, as well as about the ups and downs. – Ask the residents where we can get fresh water along the area we are going through. – Ask for the contact number of the person who can be contacted in an emergency where you depart. – Give your number to the person and tell him about your route plan. Water, Water, Water. Always remember that we can not drink seawater and that sea water bath makes body sticky. This fact is coupled with the tropical temperatures of Indonesia’s oceans. Bottom line water supply should be enough. – Provide enough water specifically for drinking, adjust by mileage. – Provide enough water for cooking. – If you can not be sure you will find a stall, do not take the risk do not bring lunch. – Make sure the supplies are adequate and appropriate to the amount of your meal and your group. – Do not skip a single meal! The mood of the sea can not be ascertained and there is no guarantee that the morning trip is easier than the afternoon or vice versa. Forget wet suits. This is not surf let alone diving. 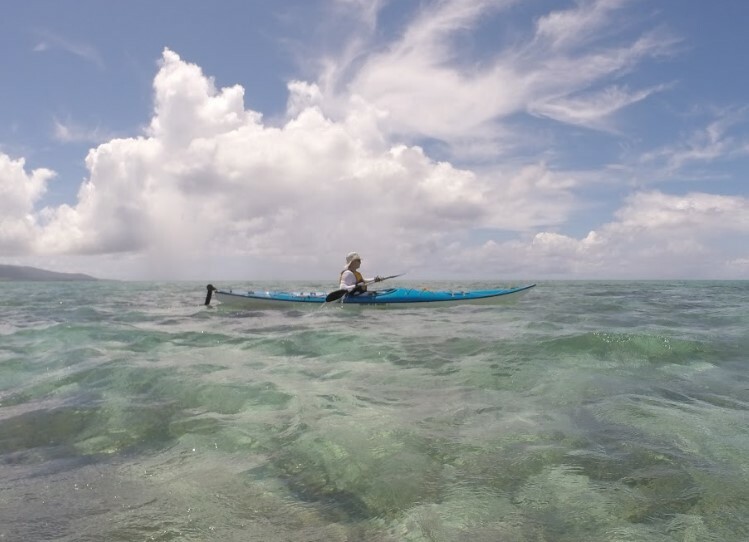 The majority of our time when sea kayaking we spend on water, not below or on the surface. Wet suit will be too dry and you will overheat. Forget about tanning as well. Sea sea kayaking trip is exciting if it takes a while and this always means longer than the duration of healthy tanning. It may be said that is suitable as Sea Kayaking clothes in tropical sea yes sailing clothes. – If using Sit-On-Top for more than an hour use trousers. – Mountain slippers or diving shoes. I personally prefer not to wear sandals in the kayak, sandals just tucked somewhere in the cockpit and then I use only if I have to land. In this case the best flip-flops are discs. – First Aid equipment must always be taken, but then again keep in mind to stay impermeable from seawater. – Oralit is very important to be brought to overcome dehydration. Remember the risk of dehydration at sea is much higher than in the mountains. – Anti Mosquito Lotion is absolutely for kayaking in Indonesia. – Sunblock is also very important. Sea kayaking is a skill in itself. All of the above readiness is part of the wandering skill with sea kayaking, and although in the short run makes it complicated, but in practice it makes sure our journey is smooth. Hopefully the sea kayak enthusiasts always pay attention to safety and comfort.